Composed by James A. Hirt. Score only. Duration 13:00. Published by C. Alan Publications (CN.09881). This work is brilliantly scored and is full of depth and emotion. In tribute to the American Heroes who have sacrificed to preserve and protect freedom, James Hirt has composed a masterwork for band that challenges performer as well as listener. Commissioned by the Cleveland Institute of Music and Case Western Reserve University Bands, Gary M. Ciepluch - Director. The composition is intended as an expression of gratitude and honor for all the courageous Americans who have sacrificed to defend and protect freedom. This single movement composition has four main sections which are subtitled: I. Count the Loss II. Freedom Remains III. But Not Forgotten IV. Solemn March of Honor Each section is intended to embody a specific mood or image associated with this austere national monument. The seemingly endless ocean of graves at Arlington National Cemetery is a reminder of the overwhelming cost of freedom. 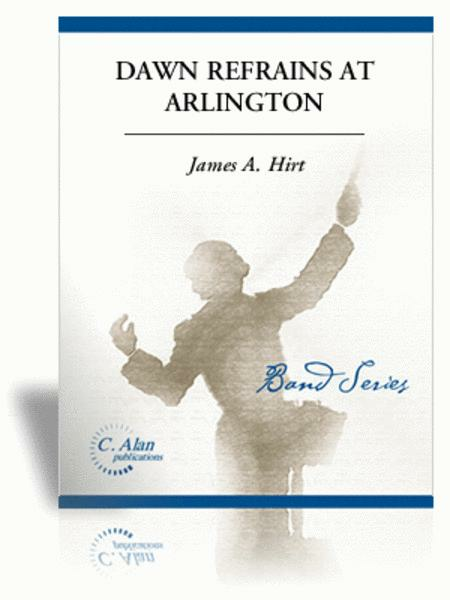 - James A. Hirt NOTES FROM DAVID R. GILLINGHAM It is an honor for me to introduce Dawn Refrains at Arlington by James Hirt, the third work in the Gillingham Signature Series. Dr. Hirt is Professor of Theory and Piano at Baldwin-Wallace College and is a relative newcomer to the wind band medium. This work is brilliantly scored and is full of depth and emotion. I am proud to include it in this series and to induct it into the band repertory. - David R. Gillingham.